Camden Shiloh’s one, two or three bedroom apartment homes are designed with distinctive details in mind. Custom comforts like a full-size washer and dryer, an open concept kitchen with stainless steel appliances including a microwave, chocolate birch cabinetry, wood-burning fireplace, built-in bookshelves, crown molding, ceiling fans, and large walk-in closets will help you feel at home. 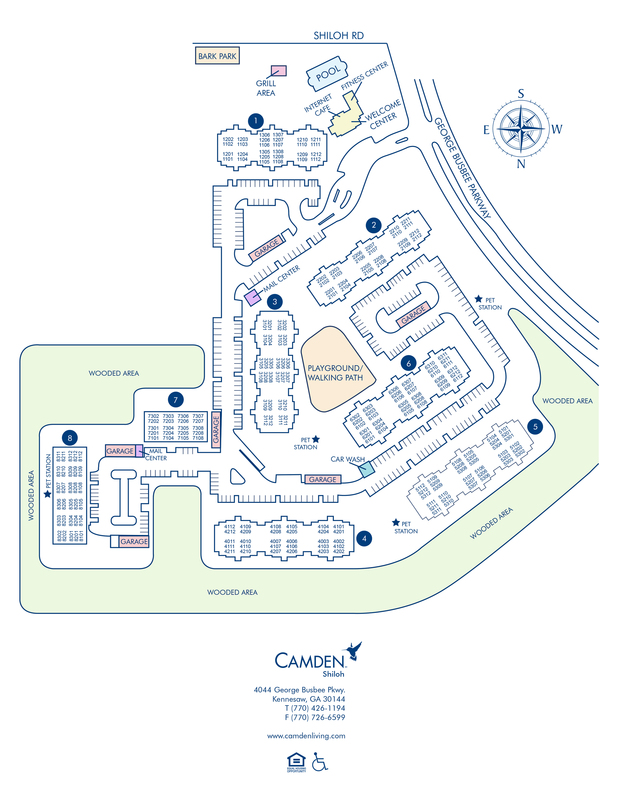 Camden Shiloh is adjacent to I-75 and I-575 which makes it easy to get to downtown Atlanta or neighboring communities. We are located in Cobb County and are only one mile to Kennesaw State University. Shop till you drop at the nearby Town Center Mall and Barrett Crossing Shopping Center and we are only nine miles to The Outlet Shoppes which includes stores like Michael Kors, Coach, Nike, and Carters. Connect with nature on the 12,000 acres of Lake Altoona, which is popular for swimming, water skiing, and fishing or take a hike up Red Top Mountain at the State Park that is only a short drive away. Whatever you like to do in your spare time, you will love taking advantage of our non-smoking amenities. Our pool is calling your name! Put your feet up and enjoy the weather on our sundeck next to the salt water swimming pool or grill some burgers and hot dogs with your friends at our outdoor grill and picnic area. Do you like to work out? Our 24-hour fitness center has cardio equipment and free weights for you to use to keep in shape. If you work from home, you will love our business center and conference room. You can even print documents from your apartment and pick it up at the WiFi internet cafe printer after you enter your special code. Did you know we welcome 3 pets per apartment? Keep your dog healthy by playing ball with your pooch in our fenced in dog park. Satisfy all of your pet needs at the nearby Petco, Shiloh Veterinary Hospital, Creekside Pet Hotel and Pet Play Place. The kids will love our onsite playground. Make your vehicle sparkle and shine when you use the car care center and then protect it from the elements in a detached garage. Residents receive a technology package included in their total monthly rent with a savings of up to 43% off retail. This money-saving package includes high-speed internet up to 150 Mbps and over 140 digital video channels through Xfinity. Use the Xfinity Go app on your smartphone or tablet to access your digital video anywhere! Come home to Camden Shiloh. Call today to make an appointment to see your beautiful new apartment home! Near Petco, Shiloh Veterinary Hospital, Creekside Pet Hotel, Pet Play Place. Garages are available to rent too! Detached garages are $75 per month.